Who could have imagined it—a trip to the Little League World Series for another team from Chula Vista in the span of just four short years? Eastlake Little League’s 12-under all-star team indeed found a way, found a way all the way to Sunday’s LLWS championship game against a team from Tokyo, Japan. 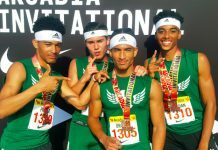 Though the recently crowned United States champions didn’t come home with their seventh championship banner in their amazing all-star tournament run this summer, they did generate a lot of community pride not only for Chula Vista but for the entire San Diego region. They remain champions in the hearts of all their fans, regardless. In fact, Eastlake was six outs away from winning Sunday’s coveted LLWS championship title before the Japanese erased a 4-3 California lead with a gallant three-run rally in the bottom of the fifth inning to post a 6-4 win. The LLWS was the ninth overall for a team from Japan and the third in the last four years. For Eastlake, Sunday’s LLWS championship game will be remembered as one of missed opportunities. Eastlake loaded the bases with none out in the top of the fifth inning, yet failed to score a run. Tibbett called the outcome simply — “that’s baseball.” That is, one team has to win and one team has to lose. Eastlake became the fourth team from San Diego County to advance to the LLWS in the past 13 years. Park View Little League became the first team from Chula Vista to win a LLWS championship title. Prior to that, Rancho Buena Vista Little League finished third in 2005. That team followed in the footpath of the Oceanside Little League squad that made the trip to South Williamsport in 2001. Eastlake is the 10th team from San Diego County to qualify to participate in the LLWS, which began in 1947. However, only two teams from the county have ever won a LLWS championship. Park View was the second; the first was El Cajon/La Mesa Northern in 1961. The fabled 1961 team featured future NFL quarterback Brian Sipe in its lineup. Other teams from the county to reach the LLWS include San Diego National (1952), San Diego North Shore (1955), La Mesa Northern (1957), El Cajon Western (1977) and Escondido National (1981). Both the 1957 La Mesa Northern and 1977 El Cajon Western teams posted meteoric runner-up finishes in the LLWS championship game, which Eastlake matched last weekend in front of 28,119 fans at Lamade Stadium and millions of television viewers around the world. For all of Eastlake Little League’s players, coaches, manager and families involved, it was simply an experience of a lifetime. “Just a phenomenal series — the kids are incredible,” Eastlake Little League President Ray Diaz said. Eastlake reached the LLWS with an 18-1 record after winning championship titles at the district, section, sub-division, state and regional levels. Eastlake, the District 42 champion, defeated East County District 41 champion Rancho San Diego, 11-7, in the Section 7 championship game on July 16. Eastlake began its championship odyssey with a 10-1 victory against Chula Vista National on June 29. The team won its first 16 games before finally tasting its first defeat in the West Region championships in San Bernardino. The Southern California state champions avenged that 3-2 setback to Northern California state champion Belmont-Redwood Shores with a 9-0 win in the West Region title game to punch its ticket to the LLWS. The magical ride was just beginning, however. Eastlake pitcher Grant Holman hurled a seven-inning no-hitter while striking out 13 batters to help his team defeat Great Lakes region champion Grosse Pointe (Mich.), 3-0, in the opening game of the 2013 LLWS. Holman—the team’s six-foot-four giant—then capped a 15-3 victory against Mid-Atlantic region champion Newark (Del.) with a walk-off grand slam home run to complement the two-hit pitching of teammate Nick Mora. Holman then supplied Eastlake with a game-winning home run in a 6-3 nine-inning thriller over Westport in the winners bracket semifinals. The win pushed Eastlake into the LLWS U.S. bracket championship game—and a rematch against the New England region champs. Eastlake won the U.S. title, 12-1, behind another two-hitter by Mora, who struck out 10 batters and clubbed a three-run home run to help his own cause at the plate. Eastlake had become America’s team. “It’s awesome — chasing the dream to Williamsport,” Holman said. Holman finished the 2013 LLWS tournament with the most strikeouts (28) while teammate Micah Pietila-Wiggs recorded the most hits (11). What was the team’s underlying success? According to Tibbett, it came down to the players simply having fun. The team’s core group has played together for the past three years at various age levels. 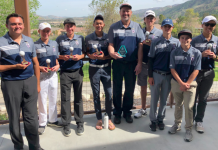 Ten of the team’s 12 players were on the Eastlake 11-under all-star team that captured last year’s District 42 championship banner but fell just short of winning the California Section 7 title. Pitcher/outfielder Charly Peterson, a newcomer to the core group, said he immediately felt the team’s feel-good vibe. 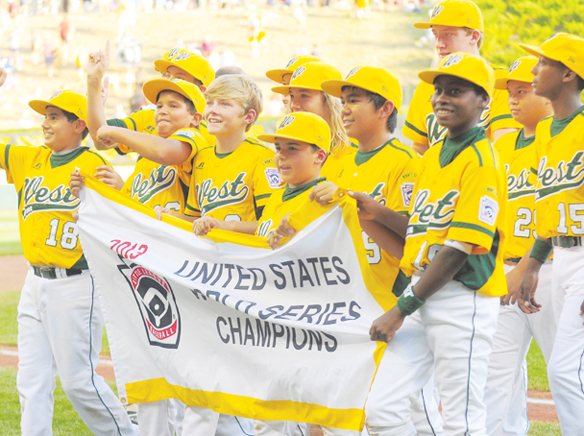 With a final 22-2 record, the 2013 Eastlake Little League team did that with extreme success. The 2009 LLWS champion Park View team received a congratulatory message from California Governor Arnold Schwarzenegger.. The team also met U.S. President Barack Obama in Washington D.C. and presented him a team jersey, team plaque and the key to the city of Chula Vista. A book was even written about the Park View team; the team also made an appearance on “The Tonight Show” hosted by Conan O’Brien. What doors will open for this high achieving Eastlake team? 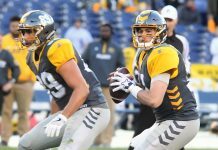 For starters, they will be feted as the guests of honor at an official welcome home celebration scheduled for Thursday, Aug. 29, at Sleep Train Amphitheatre in Chula Vista. The parking lot opens at 5 p.m., gates open at 6 p.m. and the team is scheduled to take the stage at 7 p.m. All fans — from anywhere in the county — are welcome. The amphitheater is located at 2050 Entertainment Circle, Chula Vista. District 66 champion Spring Valley defeated District 42 champion Luckie Waller to win this year’s Section 7 Senior League title.